On Thursday, the Rangers arrived in Toronto's Air Canada Centre to face the Maple Leafs in the second of their 3 meetings over the course of 2 weeks (they will return to Toronto next Friday). During the first 2 weeks of the season, the Ranger defense has been in disarray, their goaltending shaky, their offense without 2 first liners (Prospal and Gaborik) and were facing a team that totally dominated them last week in the home opener at MSG last week. Canadian and Maple Leaf flags before game time. Meanwhile, Coach Tortorella, refusing to yield to early season panic, announced that he was not going to deviate from his goalies schedule. So that meant Marty Biron would make his debut in goal paired against Jonas Gustavsson the Toronto backup goalie, starting his 2nd game of the season. Vociferous Ranger fans moaned all day long on the interweb that the game was being written off as a loss. Apparently, the Ranger players were deaf to the "unwavering" support of their stalwart True Blue defenders. 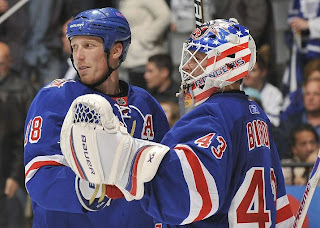 And Ranger fans seemed to forget that the Rangers routinely use visits to Toronto to use their backup goalie. This time, though, the Rangers had no Steve Valiquette ready to self-destruct in goal. Instead, the wily and capable veteran, Martin Biron, played angles beautifully, controlled rebounds, flashed the glove repeatedly like Keith Hernandez, stick-handled the puck and came up with a spectacular save to deny Mike Komisarek on a late 3rd period breakway. an "A" on his sweater for the first time. The rest of the squad play efficiently and intelligently, maintained their spacing in the defensive zone, and broke up numerous plays of the Leafs the entire night and skated away with a satisfying 2-1 victory. Official recap is here. 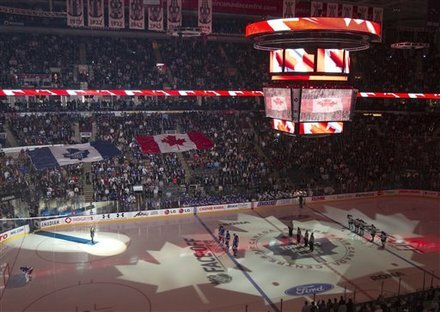 The Rangers frustrated the Leafs early, ultimately breaking their spirit late in the 3rd period as they could not enter the Rangers' zone for most of the final 4 minutes and took the fans out of the game for nearly the entire night. The team blocked 30 shots (including 12 in the first period), deflected numerous passes, stick checked the Leafs without mercy, pursued the Leafs all over the rink with a relentless forecheck and simply outworked them to puck after puck. Much of the game looked like the Rangers had tapped into old videos of Tom Renney's defense first scheme as the Blue Shirts dominated the first period with their forecheck. Biron was obviously sharp including making 2 glove saves (and holding on to the puck). Forechecking started leading to some creative playmaking but no finishing. But then, the team's 2 Russian forwards, Ruslan Fedentenko and Artem Anisimov, struck for 2 goals within 1:01 late in the first period. Monster Mash. Fedentenko (left) breaks through to break the ice at 16:11. For the first goal, Derek Stepan led a forceful rush up ice using his speed to gain the offensive zone and then using his strength to keep the puck as he went past the goal line. His shot was stopped by Jonas Gustavsson but the puck trickled behind him where Avery and Fedentenko both swooped in and the Russian smacked it into the goal for his first score as a Ranger. The refs were in good position to see the puck was not covered up and correctly did not blow the whistle. One thing this sequence exemplified was the controlled rush by defensemen all night long -- Roszival, Del Zotto, Sauer, Staal and Gilroy -- forcing the issue. What was terrific was the fact the remaining defenseman on ice would play conservatively so that the Rangers would avoid having 4 or even 5 skaters caught up ice if the play broke down in the offensive end. Gone in 60 (really, 61) seconds. Anisimov nails the game winner at 17:12 of the first. The second goal epitomized the communication on ice by the Rangers. The opportunity was created by a breakout pass across the rink from Marc Staal to Ryan Callahan who broke from the left boards across the rink, banging his stick on the ice for the pass. Staal hit him in stride and Callahan crossed the blue line to feed Michal Roszival, who, in turn, fed Anisimov in front of the net for a tip-in as he out-muscled Kaberle for position in front of the goal to give the Rangers a lightning quick 2-0 lead. Almost immediately thereafter (and with less than 2 minutes to go in the period), Sean Avery committed an ill-advised slashing penalty that could have led to one of those trademark last minute goals allowed. But the Rangers penalty kill team, which was magnificent all night long, killed the penalty for the reamining 1:49 of the period including shot blocks by Callahan, Dubinsky and 2 by Dan Girardi. The Rangers maintained their poise and position in the defensive zone and the period ended. The Rangers, besides blocking 13 shots, outshot their hosts 15-8 (and 32-25 for the game). The Maple Leafs came to life for spurts during the final 40 minutes. Early in the 2nd, they pressured the Rangers and Colton Orr missed a deflection that could have brought the Leafs close and perhaps change the momentum. Still, the Leafs could only muster single shots at Biron, there was little follow-up and few rebounds left for the taking. The Rangers, unlike prior games, were not scrambling in their defensive end but controlled the ice and the puck for nearly 60 minutes. After a slow start in the 2nd period, they started regaining control of the ice and creating opportunities. Anisimov had a few chances at scoring but was denied by Gustavsson, who played a solid game. Gilroy on a rush up ice hit the crossbar with a shot that beat Gstavaason to the glove side and unfortunately, Frolov whiffed on the rebound into a wide open net. The 4th line created some havoc in front of the net as Boyle and Boogaard had legitimate scoring opportunities and kept the puck away from Biron's end for shifts at a time. With 9 minutes to go in the game, the Leafs finally struck when one of the few times Biron was unable to control a loose puck ended up near Colby Armstrong who banged it into the net over the goalie. Less than a minute later, Brandon Prust (who had a solid game) was called for a hooking penalty. Almost immediately during the ensuing powerplay, Tomas Kaberle lifted a pass to Kris Versteeg at the Rangers' blue line who streaked in unimpeded toward Marty Biron. Biron came out to the front of crease and denied Versteeg with a combination of his glove and left pad. Immediately, the Rangers took control of the penalty kill (ending the game with a 5 for 5 performance). 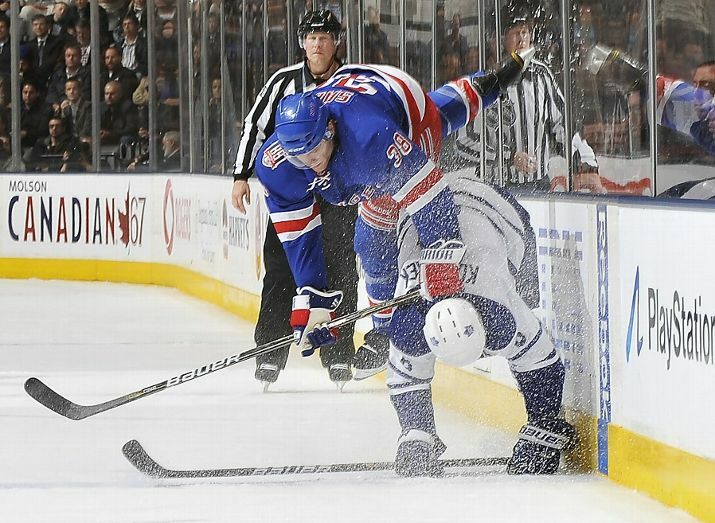 The Maple Leafs sustained some pressure over the next couple of minutes before finally succumbing to the Rangers' reassertion yet again of a tenacious forecheck and good positioning. The victory was truly a result of a total team effort. The much maligned defense saw each defenseman deliver a solid, if not outstanding, performance. Michael Del Zotto had an excellent overall game. Michal Roszival played smartly in the defensive end and contributed offensively. Michael Sauer patrolled the ice with calmness. The entire squad played a cohesive style and employed blocked shots, deflected passes, a presence at the blue line to frustrate the Maple Leafs time and time again. One word missing from their play was "giveaways" especially in front of their own net. Their absence was noticeable and contributed largely to the win as Biron could focus on the Maple Leaf players without worrying about his teammates leaving him vulnerable. Leafs in the Wind. The Rangers hurled themselves all over the ice. Here Michael Sauer kicks it up with Tomas Kaberle. Prior to this game, the other NHL teams had already played 5 to 7 games already while the Rangers had played 4 in nearly two weeks. With this type of scheduling, it is hard to develop chemistry and cohesion. The question was answered emphatically that the coaches had gotten the team to buy into a game plan and tighten up their overall play during their time off. There were genuine glimpses of the development of a strong 4th line and a chemistry between Prust and Avery. One can see Stepan starting to feel more comfortable playing an overall game and the defense playing as a unified force. The question is whether this game was a flash in the pan or the first manifestation of what the team will be. The Rangers have a tough weekend coming up. On Saturday, they travel to Boston to face the hot Bruins (4-0-1 after sweeping Washington) and then return to the Garden to face the improving Devils on Sunday night. The team is a work in progress. The important thing to see is that they build on what they showed us on Thursday evening in Toronto.